And so the homeless Welsh alcoholic came to be buried with full military honours in a sunlit Spanish cemetery, under a headstone bearing the name William Martin, RM - for Royal Marines. 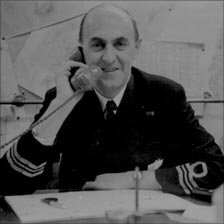 Michael/Martin was but a prop in Operation Mincemeat, brainchild of Ian Fleming, and put into action by Cholmondeley and Montagu, Churchill's "corkscrew thinkers" in the War Office. Fittingly for a deception dreamed up by a novelist, the true story of the fictional officer was turned into a Hollywood film, The Man Who Never Was, in the 1950s, after Montagu wrote a book about the plot. Prior to Mincemeat, they had created a network of fictitious double agents to feed misinformation to the Nazis. These imaginary spies were, like Michael/Martin, given jobs, hobbies, family, lovers and bank managers. The Germans thought they had an established spy network in the UK - in reality, they had none. After a tense week or so - it took the Germans several attempts to get sight of the briefcase's contents - photographs of the falsified documents made it to Hitler's desk. He was fooled, and moved an entire panzer division - 90,000 soldiers - to Greece. Montagu and his team fired off a telegram to Churchill: "Mincemeat swallowed rod, line and sinker." And so in early July, the Allies attacked Sicily. The island fell with but a fraction of the feared casualties and ship losses Britain had feared. "Mussolini was soon toppled from power," says Macintyre. "Forced to confront this Allied invasion from the south, Hitler called off a huge offensive against the Soviets. The Germans were now on the back foot. The Red Army did not stop until it reached Berlin." The tide of the war turned - thanks, in part, to the body of a tramp set adrift in the Atlantic. And the Crimelords said," 2012 shall be 2008 all over again. This is the Doomsday Deja vu as prophesied."